That hamburger-holding, chubby-cheeked cherub Bob’s Big Boy isn’t just a classic icon of the 1930s, selling burgers and seasonings across the United States. He is also the star of one of the longest running and most widely distributed comic book series in comics history, once published by none other than by Timely Comics (now Marvel) and written and drawn by industry legends like Stan Lee, Bill Everett, Sol Brodsky, and Dan DeCarlo. A recent piece by Animation Resources uncovers the humble history of the character and how one animator’s simple doodle on a paper placemat would not only go on to help build a burger empire, but cast mainstream comics in a positive light during a time when the dark shadow of the Comics Code and great comic scare of 1954 still loomed over the industry. Shortly after the opening of Bob’s burger stand in 1936, cartoonist and Warner Brothers animator Ben Washam sat down to enjoy his lunch and ended up drawing a caricature of Richard Woodruff, a ruddy young boy who helped around the stand during his free time in exchange for burgers. 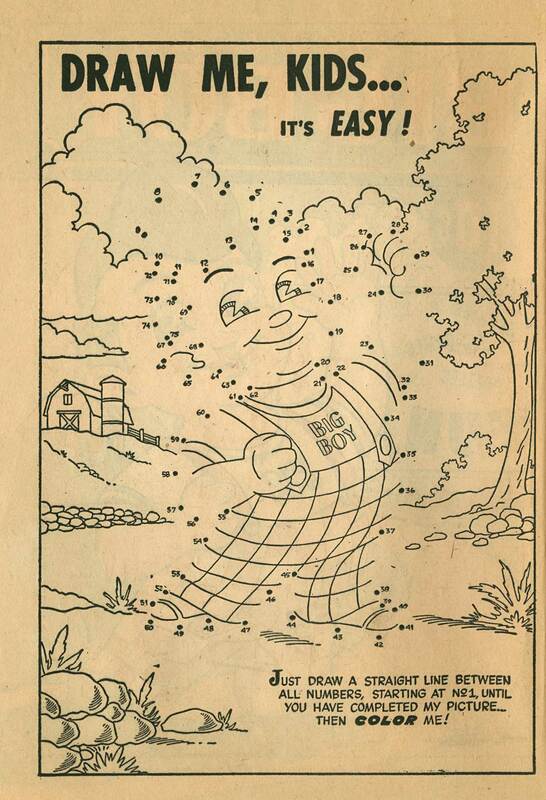 That quick caricature of the checker-clad youth would go on to become the iconic Bob’s Big Boy. 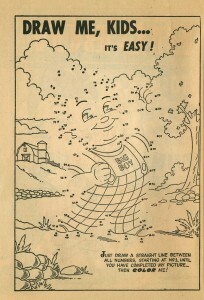 Washam’s character would not only be printed on menus and condiment bottles and appear as giant fiberglass sculptures that adored the lobbies of Bob’s restaurants across the United States, but would also be enshrined in the classic American pop culture comic book medium, further cementing his status as an American icon and becoming a shining example of wholesome comics. 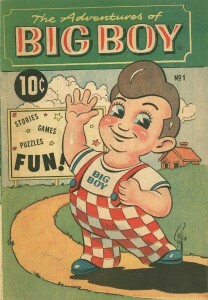 In 1956, Big Boy graced the first pages of his very own comic book series, The Adventures of Big Boy. 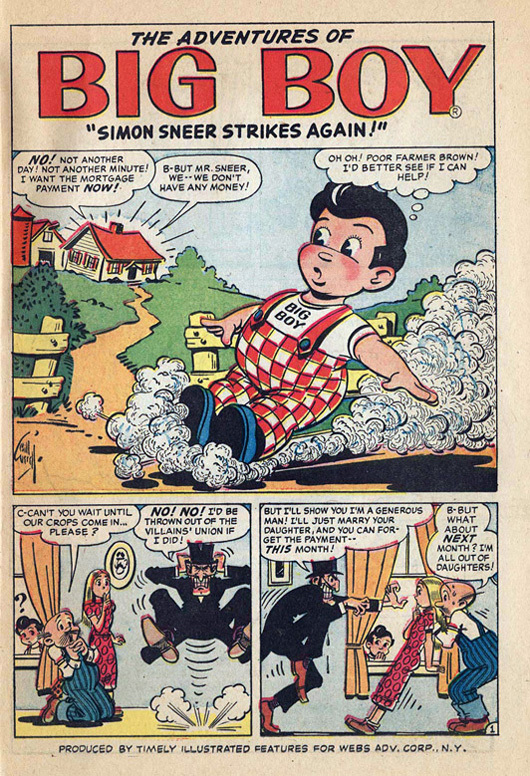 Published by Timely Comics and written and drawn by superstar team Stan Lee and Bill Everett, The Adventures of Big Boy was given to child patrons of the restaurants and used as a sales tool to keep them coming back. The perfect mix of comics and games, it was an instant hit and would become one of the longest running comics in American history, with over 500 issues continuously published and distributed. That positive reaction to the comic series would drive some of the industries greatest talent to the book. 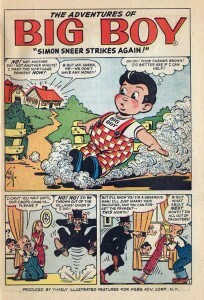 From Dan DeCarlo, best known for his work on Archie, to Sol Brodsky, comic artist, production manager, and the right-hand man to Stan at Marvel during the comics Silver Age, The Adventures of Big Boy was the comic no one would hesitate to work on or pick up. “Sol loved doing Big Boy. It was simple, it was fun and it was cute,” recalls Brodsky’s wife. 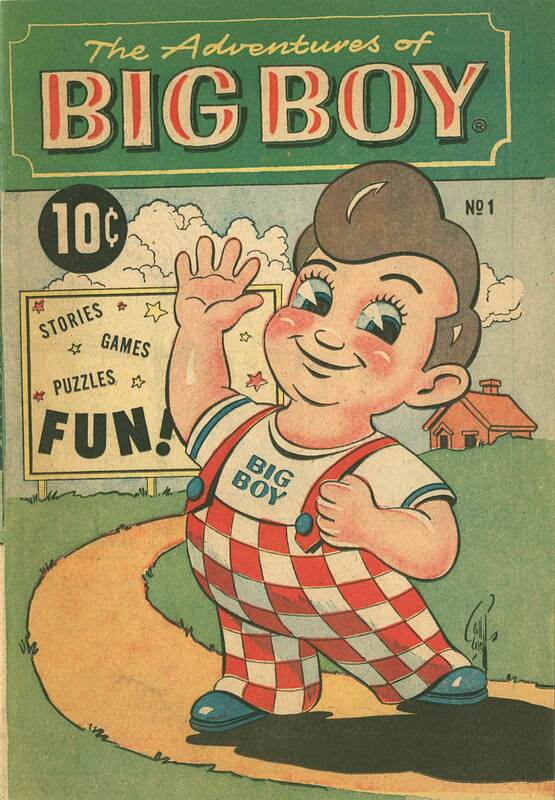 In the end, The Adventures of Big Boy is one example of a comic the burger-eating public didn’t take exception to in the era during which comics were attacked and self-censored.